Mash buttons over a burger or hot brew on King Street. Most cafes want to help you while away the day, but at 1989 Kitchen & Arcade, that's almost a guaranteed outcome. Snacking and sipping are just the beginning at this Newtown hangout. They're what you do between rounds of pumping in coins and mashing buttons, really. Yes, the arcade part of the name really does give the game away — and it's as ace as it sounds. If you fancy yourself as a master or Teenage Mutant Ninja Turtles, The Simpsons, NBA Jam or Street Fighter II machines, then consider yourself well and truly in luck. Games cost $1, and attempting to rack up a high score is actively encouraged (it'll score you a free coffee, in fact). 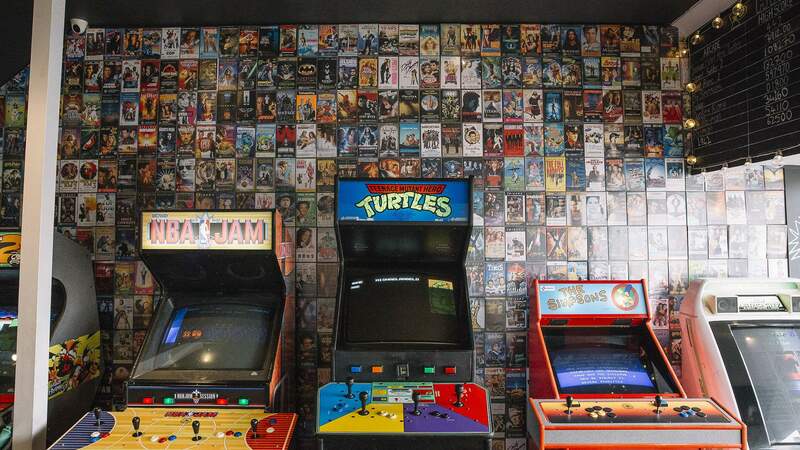 With retro consoles found around the place as well — fitting right in with the nostalgic vibe and decor, which includes a feature wall made up of 500 real VHS cases — that's your entertainment sorted. As for the appetising side of things, don't worry, that'll hit the spot as well. Open for breakfast, brunch and lunch seven days a week, the menu spans eggs or smashed avocado on sourdough and stacked brioche French toast for your early morning fix, and four types of burger (cheese, chicken and bacon, sweet potato vegetarian and fish). Sweet treats such as brownies, banana bread, raw mousse and pecan pie are also on offer, plus hot and iced coffees and chocolates, milkshakes and organic soft drinks.